It was not unusual to experience damage at Pinetree Line radar stations due to high winds. What is unusual is the apparent lack of a compiled document that provides details indicating "what happened, where, and when". This file contains a summary of "significant" Pinetree Line radar station "wind damage" that is known, and documented, to have occurred in Stephenville, NF. The wind screen on the back up search radar (CPS-5) suffered severe damage from Hurrican Edna but has been repaired by the Base AIO section and presently is in good condition with the exception of the guy wires which were considerably loosed as a result of subsequent high winds. On 12 February a high wind damaged power lines and a cross arm on a power pole supporting lines to the RX. Damage was completely repaired. On 7 March a severe wind storm caused damage to telephone cables. A small portion of the protective strip on the CPS-6B radome's outer seam was torn loose during a storm on 27 March and will be repaired in the near future by Site personnel with the assistance of the Marconi resident engineer. 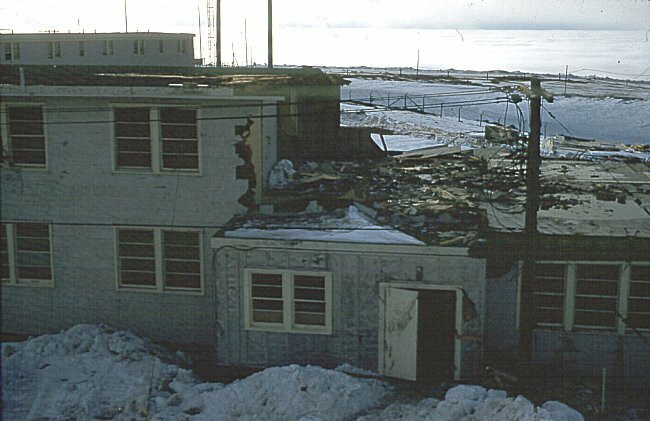 On 21 November, a 110 knot wind forced the Air Policeman sentry to evacuate the gate house. A six-by-six truck was utilized until the next afternoon when a new door was placed on the gate house. The winds and ice encountered in this quarter presented almost insurmountable problems for the Communications Section. 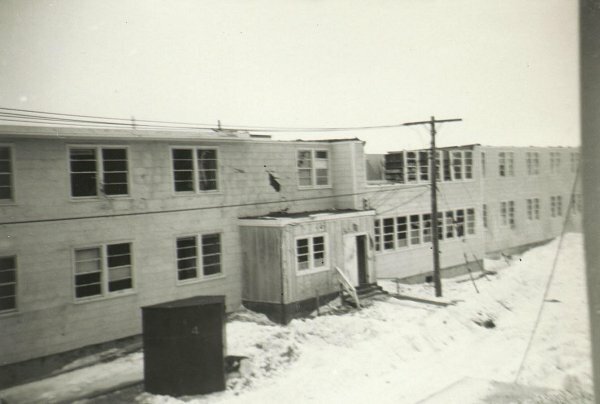 Power lines were lost to the Receiver Building when three poles were broken down and cross arms were broken off all poles for a distance of one-half mile. The Receiver Site was inaccessible for two days due to wind and snow drifts. Cables to the SOS telephones on the site access road were buried by snow drifts and were cut by the D-8 Cat as it was clearing the road. One LF antenna tower was lost during the storm of 12 December. Difficulties in the heating system necessitated major repairs in the dining hall. This work was postponed, however, due to adverse weather. During this period, Mr. Paul Bounadere, a Marconi rigger, replaced 11 HF antennas which had been blown down by storms. 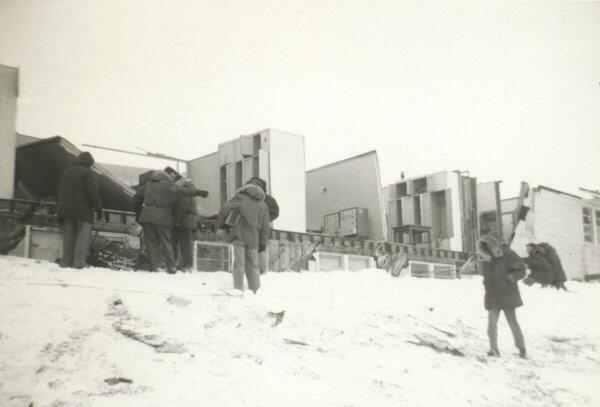 This quarter saw extremely adverse snow, wind and ice conditions which hampered the Communications Section greatly. Power lines were out due to high winds and ice. The Receiver Site was without heat and inaccessible several times. The D-8 (Cat) again cut the SOS cable while clearing snow. The boiler room in the receiver building was repaired and placed in commission after being out of order since the first ice and wind storm. A Marconi overhaul team came in June and completed a general overhaul of all our antennas. The winter's ice and wind sure raised havoc with them. This was a period of recovery and rehabilitation for AIO after the unusually severe winter weather encountered this season. Damage to guard rails, walk ways and fences was revealed as the snow melted. The bulldozer removed lots of snow, however it also left its mark in the way of broken guard rails etc. 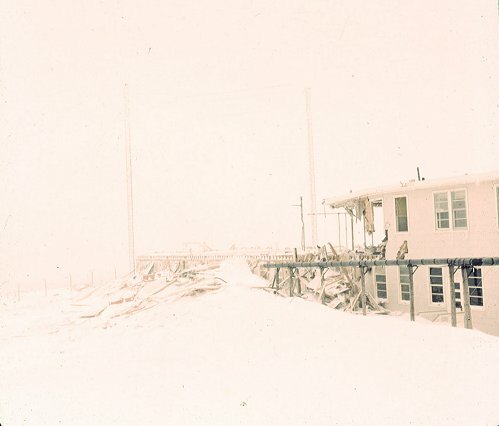 Due to the high winds and icing conditions encountered lately, six HF antennas were down and there were five power failures affecting the transmitter and receiver buildings. 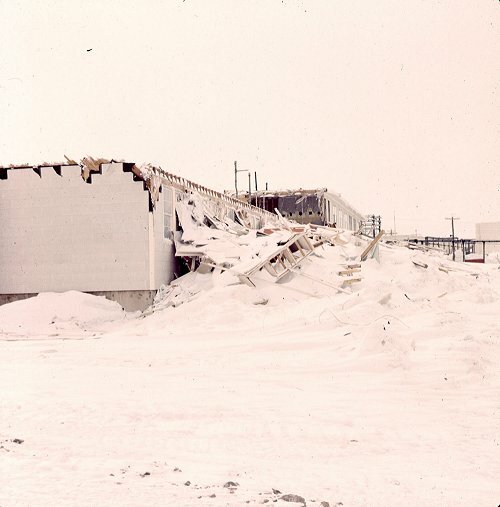 The roof and the entire back side of a two story Barrack Block ("A" barracks) were blown off the building in mid day (Friday the 13th), during a heavy and windy snow storm. The midnight crew was sleeping in the barracks at the time. By November, a new tower had been completed and installation of a rigid radome was undertaken in early December. The radome was damaged by winds in excess of seventy-five knots before installation was completed. Construction of a covered entrance to the Dining Hall was started and compl;etion delayed due to weather conditions. Severe winds damaged the roof on building 1532 and damaged building 1533 structually. The MARS Station beam antenna, which was damaged by a severe wind storm, was repaired and reinstalled. The Station is now operational. During a bad storm in December the main door to the Motor Pool was destroyed. 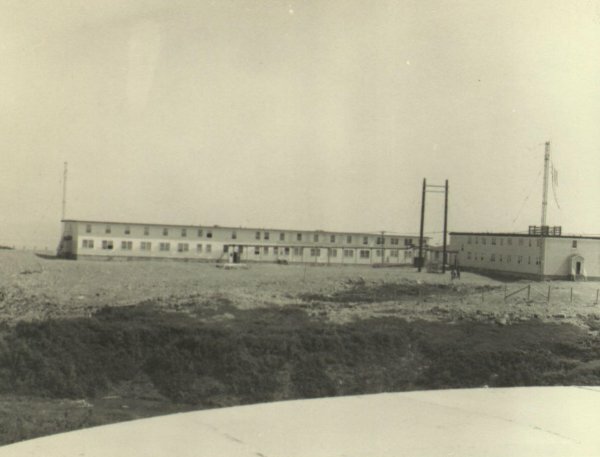 Temporary roofing was installed on "A" barracks after a wind storm damaged the roof. The Motor Pool door that was damaged by a wind storm in the previous reporting period was repaired. During a severe December storm, approximately 1,000 line feet of street light wiring was blown down. 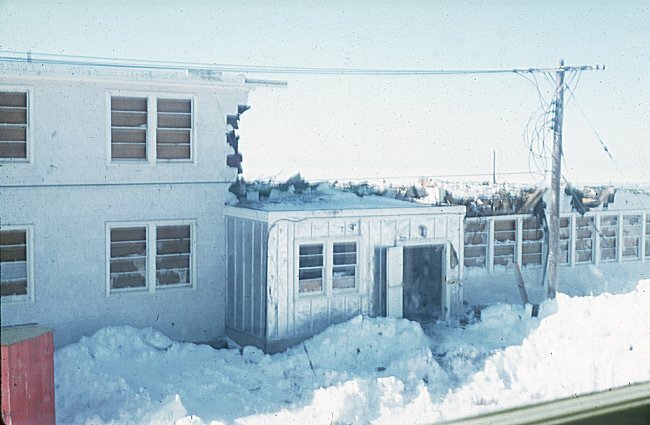 The Civil Engineers Section had many extra hours of overtime for the removal of snow and to repair windows and other areas damaged by storms and high winds.